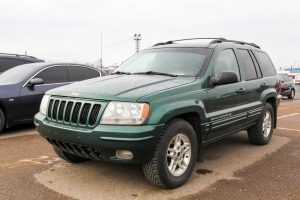 Although a Jeep is not actually a car, buying a used model is much more cost effective than purchasing new. A Jeep is a great idea for those with a sense of adventure and fun. Be sure to include some Jeeps in your search for affordable cars in St. Peters. Some people believe that a Jeep is actually a crude SUV. Jeeps are utility vehicles with different models offering removable doors and top, replacement half doors, a fold-down windshield and even holes in the floorboards for interior cleaning. • Drive anywhere, including rough, off-road trails. • Create a convertible at any time and enjoy the benefits of fresh air. • Be the center of attention on the road. • Purchase any number of accessories to individualize your Jeep. • Be a part of the large Jeep-owning and Jeep-loving community. • Explore the self-satisfying feeling of being able to complete your own repairs since they are relatively simple on a Jeep. • Drive in all seasons and extreme weather conditions. Buying a pre-owned Jeep for sale creates an excellent opportunity for self-expression and the ability to drive anywhere. If you should ever decide to sell your Jeep, know that its value is maintained for years and resale is higher than ever. For an extensive variety of affordable cars in St. Peters, including the Jeep, stop by 5 Star Auto Plaza. Give us a call at (636)940-7600 to learn about financing options for your particular situation and our current inventory. We look forward to helping you find the perfect vehicle.